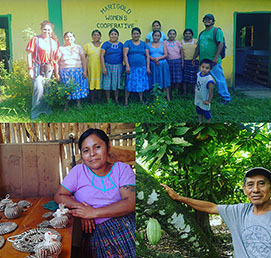 The Forest Governance Project, financed by the European Union, is developed in Belize, Guatemala, Honduras and Nicaragua, by a consortium of indigenous and community based organizations led by ICCO. In the Maya Mountains of Belize, it is implemented with the support of Yaaxche Conservation Trust, to strengthen operational capacities of the Maya Queqchi forest communities and their effective involvement in forest governance and sustainable management. The Maya Mountains, located in the Toledo District of southern Belize, are inhabited by the Q'ueqchi ' indigenous Peoples. They have lived in this territory before European settlements. These mountains are rich in natural resources, and over the years have generated logging concessions, oil prospecting and land sales, endangering the traditional ways of life of the Queqchi communities and their rights to land sustainable living. In 2014, the Government of Belize recognized the Mayan people rights to land and natural resources, based on their long-standing use and occupancy; in 2016 the Toledo Maya Land Rights Commission was stablished, to implement the consent order of the Caribbean Court of Justice which ruled that Government had to adopt affirmative measures to identify and protect the rights arising from Maya customary land tenure. Belize was also selected as a REDD Plus Country Participant. All the processes mentioned above have had slow progress. Among the main factors are the lack of availability of funds and the lack of cohesion among indigenous leaders and civil society, to have solid approaches to the state programs. In the framework of this project, Yaaxche will carry out, among other activities, capacity building for indigenous leaders on forest governance and land rights, and will produce a Transparency Report of the National Forestry Sector of Belize.